Last year, Kenya’s Beatrice Chepkoech was the best steeplechaser in the world but a missed water jump at Worlds prevented her from winning the world title. 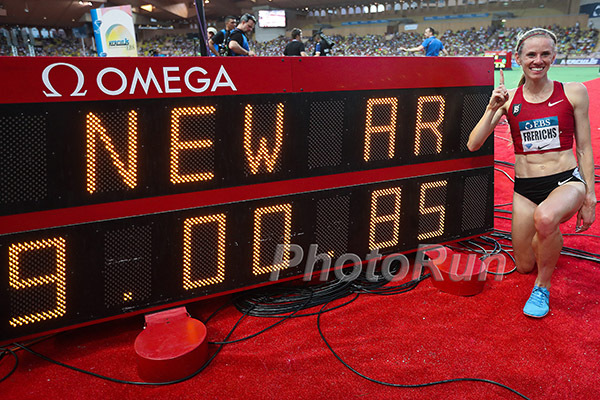 This evening in Monaco, Chepkoech showed she is best steeplechaser in history by smashing the world record of 8:52.78, clocking 8:44.32 in one of the greatest displays in the history of women’s distance running. 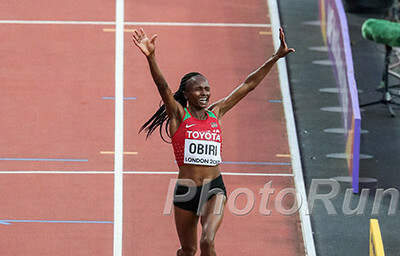 Considering the world record before tonight belonged to Ruth Jebet, who will be banned for doping in the coming months (the Athletics Integrity Unit officially announced today that she is facing a suspension for EPO), many consider the clean world record to be the 8:58.78 that Celliphine Chespol ran last year at the Pre Classic. Chepkoech beat that time by 14.46 seconds. 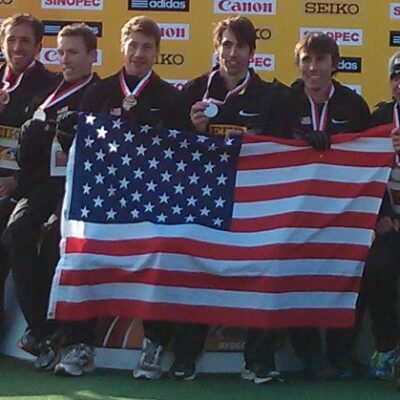 Finishing second behind Chepkoech was world championships silver medallist Courtney Frerichs of the US. 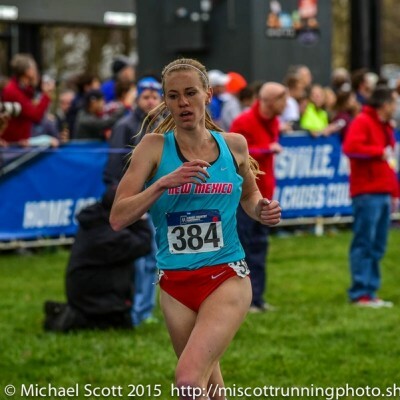 Frerichs broke Emma Coburn’s 9:02.58 American record (and her own 9:03.77 personal best) with a 9:00.85 clocking, which makes Frerichs the 6th fastest woman in history, yet she lost by 16.53 seconds (Coburn was 4th in 9:05.06). That’s how good Chepkoech was. And yet Chepkoech said after the race that she thinks she can go faster. The race itself was historic as seven women broke 9:10 — the previous record was just four. One of those women was Uganda’s Peruth Chemutai, the 19-year old lowered her pb from 9:16.89 to 9:07.94 to finish sixth. In the process, she broke 2005 world champion Dorcus Inzikuru’s national record of 9:15.04 which had stood since June 14, 2005. Chepkoech showed her intent to run fast from the gun. When she and pacemaker Caroline Tuigong, the 2006 world junior champ, hit the finish line for the first time just over 200 meters into the race, they had already gapped the field by more than a meter. Tuigong would barely make it 1k (2:55.23) and then it was all up to Chepkoech. Often in the steeple the second kilometer is the one where you see a world record attempt go awry, but here just the opposite occurred. WIth Tuigong off the track, Chepkoech accelerated. With Tuigong’s help, Chepkoech had run a 71.4 400 from 600 to 1k, but on her own she proceeded to picked it up, running her next two 400s in 68.6 and 70.5. When Chepkoech hit 2000 in 5:49.81 looking full of run, it was clear that, barring a fall, the world record was going to be obliterated. Chepkoech slowed a bit on the penultimate lap (she ran a 71.4 from 2200 to 2600) but with history awaiting, she looked fantastic over her final 400, which she covered in 66.8 according to race organizers (Note: The race organizers estimated every 200 split; remember, because of the inside water jump, each lap is a little less than a full 400. We timed her last full lap to be 66.4). Behind Chepkoech, Uganda’s Peruth Chemutai, the teeanger who was 7th in her Diamond League debut in Shanghai in May, was the only one who dared to try to run close to Chepkoech. At 1k, Chemutai, who snagged the silver behind Celliphine Chespol a week ago at World Juniors, was within a second of Chepkoech (2:56.0 vs 2:55.4), but once Chepkoech accelerated on the fifth-to-last lap, her lead instantly got huge as a lap later she led by 3 full seconds. The two Americans in the field realized the pace was super hot early and ran smartly. The world champion Coburn was the 5th racer at 1k in 2:57.3 with Frerichs just behind her in 7th in 2:57.8. Frerichs passed Coburn between 1600 and 1800 and hit 2k in 6:00.5 before coming up just short of becoming the 5th woman under 9:00. What a performance. 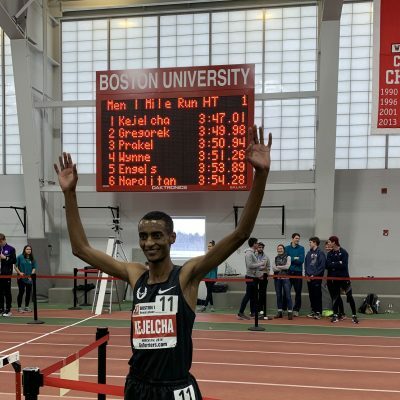 If you told us before the race that Chepkoech was going to break the WR, we wouldn’t have been shocked as after all she is a 14:39 5000 runner and we imagine a 14:39 5000 runner can beat Emma Coburn, who has a 9:02 pb, by more than 10 seconds in a 3000-meter long race. But 8:44 and a 15-second PB while looking good virtually the entire way with only a slight stutter on a single barrier on the last lap? That’s truly phenomenal. Chepkoech was simply magnificent. And she looked so, so good doing it. At 2k, her face was so calm it looked like she was in the midst of a tempo run. Coming into the race, we’re sure world champ Emma Coburn was focused on one thing: breaking 9:00. 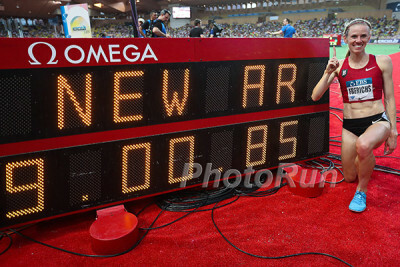 Now after the race, she doesn’t hold the American record anymore as she lost for the first time to Courtney Frerichs. That has to sting a little, but Frerichs paid tribute to Coburn after the race. It’s not a farce. The WR is soft. They need to raise the barrier heights. You tell me which is soft. In our pre-race article, we wrote that we viewed the 9:00 barrier for women as being slightly easier to achieve than 8:00 for men. But 8:44 is way out there. We think the best way to compare the two records is to compare them to the 20th-fastest flat 3000 performer in history. The men’s steeplechase record of 7:53.63 is 5.56% slower than the time put up by the 20th-fastest outdoor 3000 man ever (7:28.70). For the women, before tonight, the steeplechase world record of 8:52.78 was 5.37% slower than 20th flat 3000 performer in outdoor history (8:25.62). Now it is 3.70% slower. But remember, the women’s steeple height of 30 inches is relatively much lower than the 36 inch men’s height so the women’s WR should be a lower percentage of the flat 3000 mark. After the WR was set, we called up LetsRun.com stat guru John Kellogg – who didn’t watch the meet and had no idea what had happened – and asked him what he thought the women’s steeplechase WR should be. Based on flat 3000 times, he said he thought it should be between 8:42 and 8:45. So there you have it. Talk about this historic race and meet on our world famous messageboard.